This article describes how to setup the host PC and the target device for this purpose. "DisplayMode" = "dword:1"    ;Default is 1. 1 = show message box, 0 = show IP on desktop. In the default configuration, the target device is setup to get its IP address from a DHCP server. So the address can change after a reboot of the target. This registry entry is already there in newer images but it is disabled by a "_" prefix. Optionally you can change the Default device to the new device. In VS2013/2015 debug settings are project-specific. Please notice that if you don't set the IP address there Visual Studio 2013/2015 will prompt for an IP address the first time you'll try to run your application. In our experience this quite often leads to a unrenponsive instance of Visual Studio that should be closed from task manager. It's always better to configure the IP in advance for your projects. If you want to deploy your applications permanently on the device choose a deployment path under \FlashDisk. 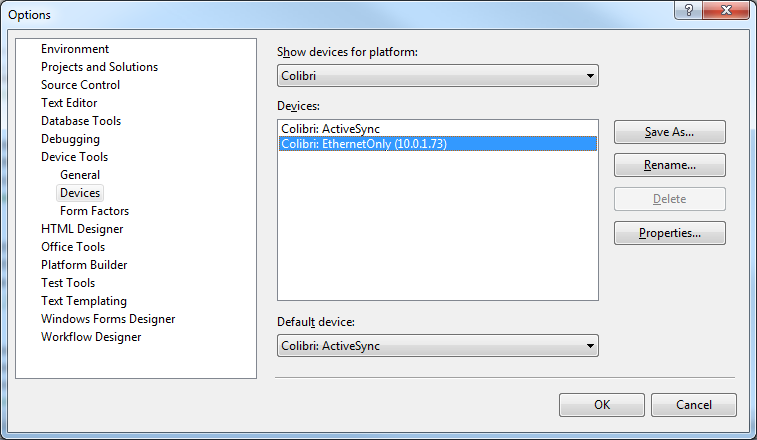 Start->Programs->Colibri Tools->Visual Studio Debugger If you can't find this entry or you are building your own image, you have to copy them manually. When more than one ethernet adapter is connected to the system, by default only the first (on-module) adapter is available as a debug interface. The 2nd ethernet adapter can be enabled for debugging by adding a registry key. The exact value of the multi-string ("AX88772B2","AX8877B1") depends on the module and ethernet adapters you use. The adapters are listed under [HKEY_LOCAL_MACHINE\Comm]. If you don't find the Start debugger client on the target device you have to do this. Insert the storage device you previously prepared into the target device and boot the module. The files will be copied to the target's root folder. After you have started CMAccept, you have only 3 minutes to start the debug session on the Visual Studio side! VS2008 will start to communicate with the target device. Another dialog should appear and announce a successful connection. Debug session is started automatically when you choose to deploy or debug/run your application. 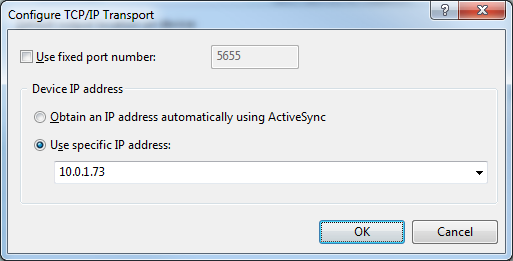 If you haven't set an IP for your target device, you'll have to insert it when prompted. We discovered that inserting the IP on first execution/deployment often leads to a non-responsive Visual Studio 2013/2015 instance. 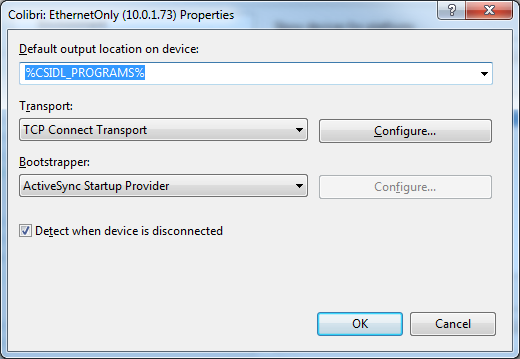 It's better to configure your device's IP in advance as described in the instructions above.